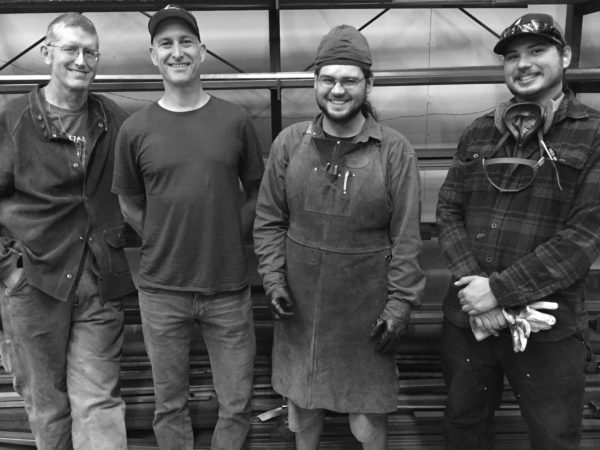 We are Jim Schnauss and Todd Harrison, owners of Blackbird Iron & Design, and craftsmen with over 40 years combined experience creating custom metalwork. 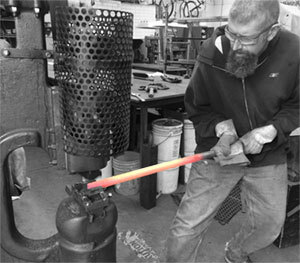 We founded Blackbird Iron in 2010 with the desire to design and build high quality custom metalwork and opened up shop in the Interbay neighborhood of Seattle. 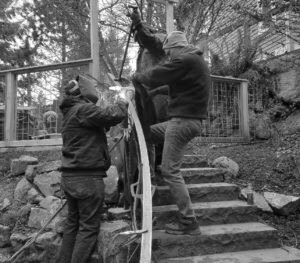 In 2017 that shop was torn down to make way for retail shops, and so we relocated to an even larger shop in Fremont, brought on some new employees, and now we have an even greater capacity to build your custom ironwork project, big or small. Jim, Todd, Nelson, and Zolton. The first step is to meet with you, understand your needs, and discuss options for a design. We will then develop that design into a concrete proposal for your project. Our shop is fully equipped to fabricate and finish your project, and we have the experience to get your job done right. We offer many finishing options including high quality spray paint, catalyzed automotive paint, or powder coat. Our years of experience and precise engineering mean a smooth installation process. It is one of the first things we consider when designing a project. We respect the spaces we work in, and do our best to keep the inconvenience to you at a minimum. The cost of your metalwork will be determined by the labor involved to fabricate and install it, with materials and finishing counting for a percentage of the total. Blackbird will work with you to create a design that fits your budget, and explain the finishing options most suitable for your job. Our goal is to assure you get the metalwork you want and the quality you expect. Every project is unique, so we will give you an estimated duration of installation at the time we present our proposal to you. 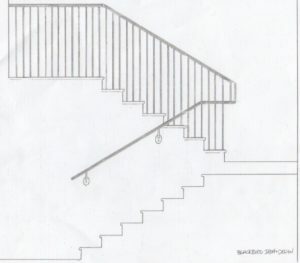 Small railings might take a half day to install; full deck railings might take two or three days. Because we consider the installation process during the design and engineering phase, our installation process is efficient, with as minimal impact on your site as possible. Blackbird puts projects in our job queue based on when we receive a signed contract and deposit, and at that time will give you an estimated start date. We can usually reserve an estimated job “start window” for projects that aren’t ready to begin for a while (such as deck railings where the deck has yet to be built), and adjust accordingly as the date approaches. Lead times for jobs typically vary with the seasons, with shorter lead times for jobs built in the winter off-season. Can we see our project while it is being built? Yes! We are excited about the work we do, and would love to share it with you. Please just give us a call to schedule a visit to our shop. in Seattle’s Pacific Northwest Magazine.